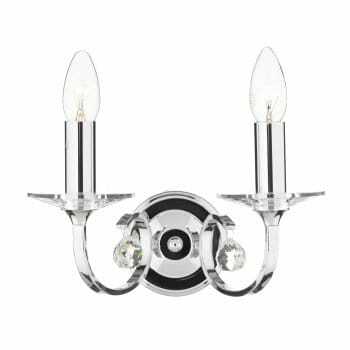 Dar Lighting Allegra 2 light wall fitting in a polished chrome finish features a metal frame that is decorated with crystal droppers and glass sconces. The product code for this Dar wall fitting is ALL0950. This beautifully designed light fitting will be a pleasing addition to any suitable room. Operated by a pull cord switch and double insulated. A 9 light multi-arm ceiling fitting, a 5 light multi-arm ceiling fitting and a 3 light ceiling pendent are also available in this finish. This range is also available in antique brass finish.